Mode selection pin. Connected in parallel with the onboard MD button. Use an open collector circuit to control this line as pressing the MD button short-circuits the line onto the GND. Red status LED control line. Also connected to the onboard LED. Maximum load on this line is 3mA. Use a buffer (logic gate) if higher current is desired. Green status LED control line. Also connected to the onboard LED. Maximum load on this line is 3mA. Use a buffer (logic gate) if higher current is desired. Output of the onboard 3.3V regulator. Can supply up to 1A of current to external devices (1.3A without the WA2000). This line can also be used to power the EM1001. Use regulated 3.3V power source only! Switching regulator supply voltage in the 8-20V range. The regulator generates 3.3V power for the onboard circuitry, WA2000, and external devices connected to the 3.3V line. 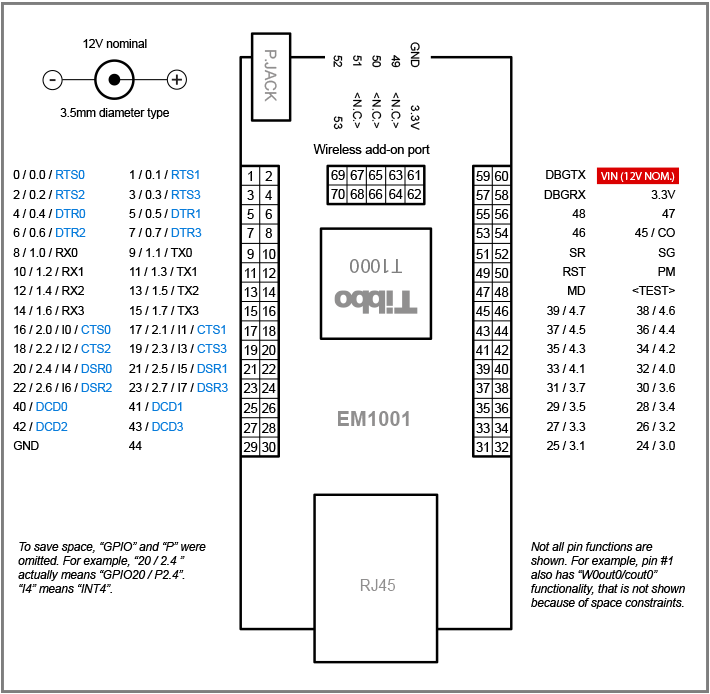 There is no need to use this input if the EM1001 is powered directly through the 3.3V line. This line is also connected to the positive terminal on the power jack. 3.3V power available on this pin. Do not connect to the power source. 4.This pin is on the wireless add-on connector.